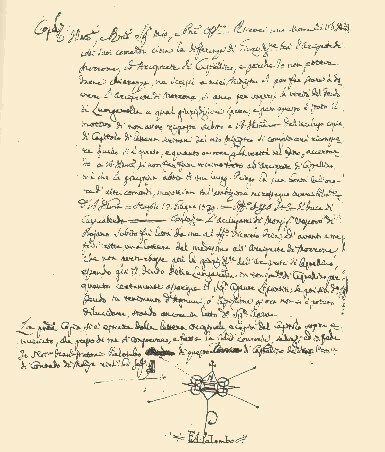 n the ancient library of the maternal ancestors, the Cinelli, those authentic connoisseurs of ancient things that are the brothers Vittorio and Nicola de Benedictis, found an important notarial copy from the eighteenth-century of an appraisal of Morrone, performed in 1593 from the napolitan «tavolario» Aniello of Gennaro, to whom from Alfonso of Avàios of Aquino, marchese of Vasto, Prince of Pescara etc. etc. lieutenant of the Main Camerario of the Sicily Kingdom etc. it was ordered that they would «personally confer in the aforementioned Land et that, et soi entrance, et yield» appreciate minutely, being that necessary to resolve the lawsuit between the Magg. Ferrante Carafa, of Morrone at that time mister, and his creditors. They learnt news so completely unaware before, if they confirm of either deny or correct other, and all for the molisana history they are of big interest. There were at that time in Morrone two hundred and nineteen fires, (family units) but «sixty five houses uninhabited et desert, among which twenty-seven completely ruined, demolished, because the inhabitants left and went to other countries» because excommunicated from the Bishop of Larino because of the lawsuits on the tenth demands and from he himself and from the baron besides that from the local clergy. The wall surrounded the houses, arranged in length, and divided from «a master road, that begins from the Door of S. Angelo, et ends to the Door of the Cornicchio, and The Castle », in front of the Castle there is a wide slow, that from bona vista (good sight), in the middle of the Land there is another little road across, that leads to the third door said the Portabrezza. Nowadays only the last one is with the name of Door Celsa and the road that leads to it is Via Roma, while of the first one they speak only rarely, of the second one they have lost every memory. All the houses were short, with a « ground » or one floor, covered by scandole except for that baronal, «done such as a castle, et so questioned by everyone». Supplied with a steep slope, mergolatura, courtyard, cistern (the eternal problem, of the water, up here! ), and raising bridge and stable (still today names stable of the court), and two grain warehouses. It is lacking instead the prison, for that it was bought another building, that included also a little room, two rooms and a kitchen, that the Captain used. Of the three present churches, the «large capable of the People said S. Maria» it was lacking of garments, and among the other relics possessed an arm of S. Roberto from Salle, here lived and dead, of which there is no more track; nine priest officiated there of the greater and minor orders, wretched in the clothing: their grounds were left uncultivated for the aforementioned cause of not paying a third of the harvest in decime; San Giacomo is today falling down, and Saint Angelo doesn’t exist any more. The Badia of Saint Maria Casalpiano, belonging to Fabrizio Carafa, delighted of papal privileges, and also the Monastery of S. Roberto of the Order Celestino and plus that of S. Nazario, of Zoccolantí were very flourishing and the last one was also provided of rich library. Then like today, the water «fresh et bona», drawn from the Pozzillo and Schiavonesca fountains, after «laborious chimney, penninoso and stony». To the Biferno, where there were boats and Mills of the Baron, they fished eels and barbi. In the fields, in big part for seeding, they produced good grains in big quantity, barley,, legumes and linen (today nonexistent cultivation), «very good wines», but little oil, that was imported; the rest was forest, part of which was extracted for order of the baron «from certain Schiavoni that make them come and inhabit in aforementioned fief, et they are from seven fires». There was a notary, but there weren’t medical doctors and spice-sellers. All the «Land» was from the Tavolario appreciated about thirty thousand ducati, but -he asserts- that the poverty and the misery that was seen everywhere, were due to the baron outrage, all mentioned, and of the lawsuits still in course between Baron and Bishop and the community from the other end. What best comment and warning? he Land of Morrone situated in the prov. (province) of Molise far away from this Town of Naples sixty miles, from Campobasso twelve miles, from Benevento thirty miles, from the town of Larino eight miles, from Coglionisi (Guglionesi) twelve miles, from the navy about sixteen miles according the new and last numbering N. 219 I say two hundred and nineteen, because after the numbering for what it shows it has been lacking, awaited, there are from sixty five empty houses, desert, among which there are twenty-seven completely ruined, demolished, because the inhabitants left and went to other countries because excommunicated from the Bishop of Larino because of the lawsuits on the tenth demands and from he himself and from the baron besides that from the local clergy. It is built up to a high mountain, that has two miles of slope and divided from a master road, that begins from the Door of S. Angelo, et ends to the Door of the Cornicchio, and The Castle, in front of the Castle there is a wide slow, that gives bona vista (good sight), in the middle of the Land there is another little road across, that leads to the third door said the Portabrezza (Today Door Celsa). All the houses were short, with one floor, covered by scandole. There is also the baronial house, done such as a castle, and so called by everyone because supplied with a steep slope, mergolatura, courtyard, cistern, and raising bridge. Outside the house there is a stable, and two grains warehouses, moreover it was bought another building, that included also a little room, two rooms and a kitchen, that at present time it is used as a prison, because in such house the Captain lives. Inside the Land there are three churches, one large and capable of the People, of S. Maria, lacking in garments, and there are some relics among which an arm of S. Roberto devoted to such Land, there are some chapels served by nine priest of the greater and minor orders. At present it is said that ….. (not legible part)…. 160 of grain and less in legumes and linen, and they live poorly, as it demonstrates their clothes. There is a Monastery of S. Roberto of the order Celestino, there are two monks, and a servant, the Monastery has formed with order, there are comfortable, they say from about hundred fifty Ducati of input of the lands, that make cultivate, and vineyards, and another Monastery of Zoccolanti for half mile far away said Saint Nazzario, there are eight Monks four Priests four Laymen live begging, awaited, the Baron gives them thirty of grain, and fifteen vine barrels, the Monastery is quite formed with plaustri, garden, refectory, other convenience, and for the rest of the living they get it from the city and from the close Lands, and they hold an animal with that they go and beg, it is far away half mile. There is another chapel of S. Gio of Ruggii said San Giovanni of the Rossi, rural benefit of the Reverend Don Paolo Cornelio, it holds an entrance of Terraglio of about twenty to twenty five Ducati. Within the Land there isn’t water and to water the animals outside the Land from about a quarter of miglio,there are two fountains, that are one in one side and the other in the other side of the land, one named the Schiavonesca the other Pozzillo, country fountains with two taps each one, fresh water et good, however the walk is painful, because it is penninoso, (hilly) and rocky. To the lower part from about two miles there is the river Biferno, big river, that produces eels and fish whose name is Barbi, where there are the mills of aforementioned mister Baron, and the Barchere there are other waters for the territory that gush from little moment that are winter waters because in summer there is not much water, down the Land towards Campobasso there are the vineyards for about half a mile where there are also some foots of olives, and of fruits, they make very good wines, and little oil, however it comes often from outside and good price. Far away from the Land from about two miles there is a forest said Cerri, and other wild wood of the demanio of the Land, from about half mile of circuit, from which the citizens use the firewood, et beside it there is another forest the feud of Castiglione, from about one and a half mile of circuit and it is of the mister Baron, and he made extract from certain Schiavoni that came to live in the feud and came with seven fires (seven family units) there is another forest as defence of Colle Pezzato, of oaks and since two years they sold to the Baron. The remaining territory is for country and for seeding, it is a fertile territory if quite stony and with limestone, they make plenty of good grains, not only for themselves, but also to sell, and they carry it to Campobasso, and if they cultivated all territory, how it was before the lawsuit of Monsignore there were big quantity of grain, barley, they sell legumes, and linen for themselves because they don’t sow too much. The people of that Land are country people, there is a notary, two shoemakers, three ironman and two cositori, (tailors) but there are no spice-sellers not either medical doctors, they go to Campobasso and to Larino, and to the close Lands when they need. The Land has good air, it is windy to be so eminent, that every wind is able to blow there. The Land itself is poor, does not hold properties for appraisal, and Carlini is paid fourteen for Ounce, he holds as a debt from about four thousand Ducati caused by the lawsuits, that he had and has, either with the Baron, and the Bishop, as it was said above. The citizens are mostly poor, that live at the day, that go with others in Puglia to look at animals, and work on the field, and not many others work on the field, there are not so many bulls, that they don’t reach twenty five pairs, about sixty cows, about one thousand and sixteen hundred sheep and fifty porks that the citizens have. The Land Register, and those citizens declared, that because of aforementioned lawsuits, and debts they left the country, and many citizens failed. The aforementioned animals are maintained in the Land of territory that is about seven miles of circuit. It confines with the territory of Casacalenna, of Lupara, of Ripa, Provvidenti, Castle of Lino and Locitto (Lucito). To mind the Camerlengo that is sworn of the Court. The original trial of the appraisal is in the file of the Regia Room, and properly in the High-Last Room under the roofs. The Appraisal was done in 1593.